The Lenovo Storage E1012 and E1024 Disk Expansion Enclosures offer universal storage expansion capabilities that are designed to provide simplicity, speed, scalability, security, and high availability for small to large businesses. 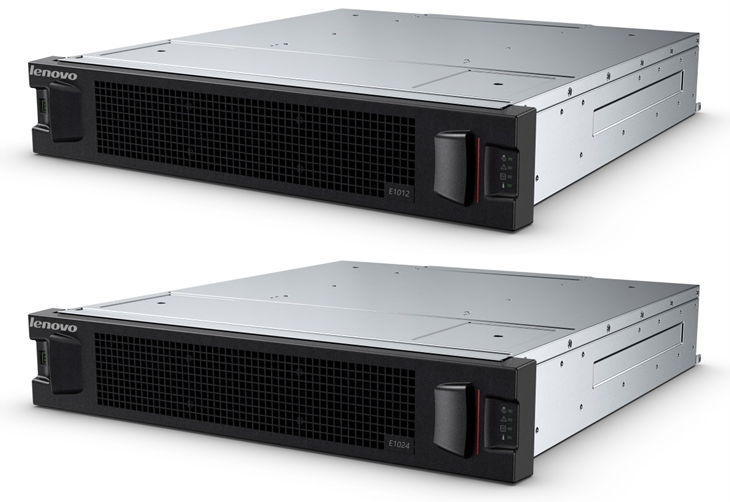 The E1012 and E1024 deliver enterprise-class storage technology in a cost-effective solution with flexible drive configurations and RAID or JBOD (non-RAID) host connectivity or Lenovo storage area network (SAN) array expansion. This product guide provides essential pre-sales information to understand the structure of the E1012 and E1024 expansion enclosure offerings, their key features and specifications, components and options, and configuration guidelines. This guide is intended for technical specialists, sales specialists, sales engineers, IT architects, and other IT professionals who want to learn more about the E1012 and E1024 and consider their use in IT solutions. The E1012 and E1024 expansion units are designed for a wide range of workloads, including big data and analytics, video surveillance, media streaming, private clouds, file and print serving, e-mail and collaboration, and databases. The E1012 and E1024 expansion enclosures offer flexible drive configurations with the choice of 2.5-inch and 3.5-inch drive form factors, 10K or 15K rpm SAS and 7.2K rpm NL SAS hard disk drives (HDDs) and self-encrypting drives (SEDs), and SAS solid-state drives (SSDs). With support for daisy chaining, the E1012 can be scaled up to 960 TB for capacity-optimized configurations, and the E1024 can be scaled up to 192 drives for performance-optimized configurations. The E1012 and E1024 expansion units are universal enclosures that can be used with Lenovo System x and ThinkServer systems as direct attach storage (DAS) or as expansion for the Lenovo Storage S2200 and S3200 storage area network (SAN) arrays. The E1012 and E1024 are designed to support the complete range of data storage requirements, from highly utilized applications to high-capacity, low usage applications. Additional drives and expansion units are designed to be dynamically added with virtually no downtime (operating system dependent), helping to quickly and seamlessly respond to growing capacity demands. The following figure shows the front of the E1012 drive expansion enclosure. The following figure shows the front of the E1024 drive expansion enclosure. The following figure shows the rear of the E1012 and E1024 drive enclosures with dual I/O expansion modules. Single I/O module configurations are also supported. Note: The expansion modules (shown in Figure 4) have additional service ports with a specialized connector, and these ports are reserved for use by a Lenovo service technician. The following table lists the E1012 and E1024 system specifications. I/O expansion configuration Single or dual I/O Expansion Module configurations supported. Single I/O Module enclosures can be upgraded to dual I/O Module enclosures non-disruptively. E1012: 12 LFF hot-swap drive bays; up to 8x E1012 enclosures can be daisy chained on a supported RAID adapter for a total of up to 96 LFF drives. E1024: 24 SFF hot-swap drive bays; up to 8x E1024 enclosures can be daisy chained on a supported RAID adapter for a total of up to 192 SFF drives. Drive technologies SAS and NL SAS HDDs and SEDs; eMLC SAS SSDs. Intermix of HDDs, SEDs, and SSDs is supported within an enclosure, but not within a RAID array. Host operating systems Microsoft Windows Server 2008 R2, 2012 and 2012 R2; Red Hat Enterprise Linux (RHEL) 5, 6, and 7; SUSE Linux Enterprise Server (SLES) 10, 11, and 12; VMware vSphere 5.1, 5.5, and 6.0. Cooling Redundant cooling with two fans that are built into power supplies. Power supply Two redundant hot-swap 595 W AC power supplies. Hot-swap parts I/O expansion modules, drives, power supplies/fans. Warranty Three-year customer-replaceable unit, parts only limited warranty with 9x5 next business day. Service and support Optional warranty service upgrades are available through Lenovo: on-site support, 24x7 coverage, 4-hour response time, 1-year or 2-year warranty extensions, Hard Drive Retention. The following table lists the models of the E1012 and E1024 expansion enclosures. Lenovo Storage SAN Rack Mount Kit - Rails 25"-36"
The E1012 and E1024 support single and dual expansion module configurations. Standard models of the E1012 and E1024 ship with one or two expansion modules (see Table 2). Single module configurations can be upgraded to dual module configurations non-disruptively. Each expansion module has two 6 Gb SAS x4 ports (Mini-SAS SFF-8088 connectors) labeled IN and OUT. These ports are used for connections to a supported RAID adapter installed in a server and for daisy chaining the E1012 and E1024 enclosures between each other. The external port on the RAID controller is connected to the IN port on the expansion module, and the OUT port on the expansion module is connected to the IN port on the expansion module in the adjacent enclosure and so on. 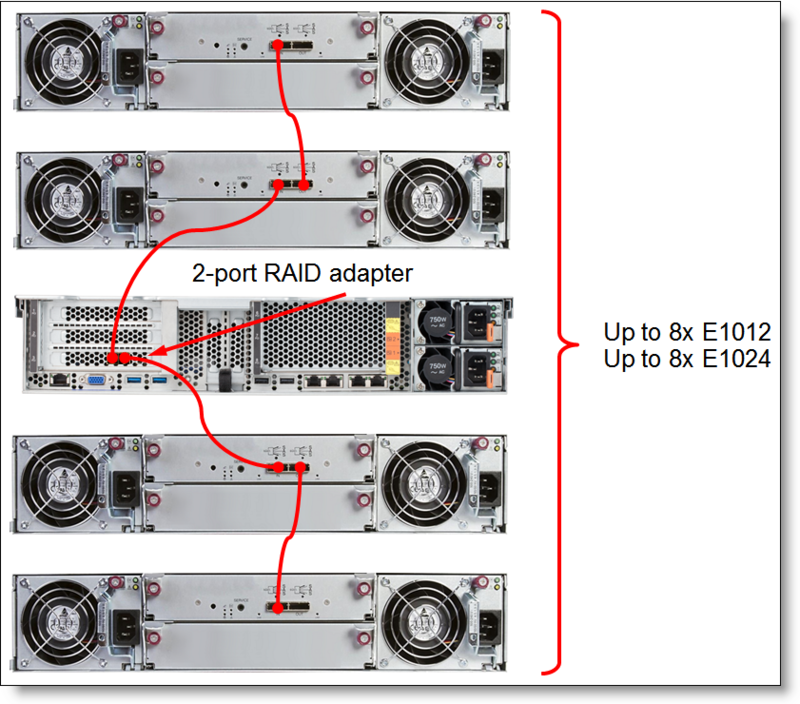 Single I/O module configurations can be used with a supported RAID adapter or HBA. In this topology, each port on the adapter is connected to a separate chain of single I/O expansion enclosures, as illustrated in the following figure. Dual I/O module configurations can be used with 2-port RAID adapters for high availability and performance. In this topology, each port on the RAID adapter is connected to a different I/O module chain within the same chain of dual I/O enclosures. Dual I/O connectivity topology without enclosure redundancy is shown in the following figure. Dual I/O connectivity topology with enclosure redundancy is shown in the following figure. The following table lists the maximum number of the E1012 and E1024 in a chain on the same adapter. The following table lists ordering information for the expansion modules and related connectivity options. * One cable per SAS expansion module. The E1012 enclosure supports up to 12 LFF hot-swap drives, and the E1024 enclosure supports up to 24 SFF hot-swap drives. The following tables list drive options for the E1012 and E1024 drive enclosures. The E1012 and E1024 ship standard with two 4.3m, 10A/100-250V, C13 to IEC 320-C14 Rack Power Cables. Other power cable options are also available, and the part numbers and feature codes to order the power cables (two power cables are required per each E1012 and E1024) are listed in the following table. The E1012 and E1024 have a three-year parts only warranty with 9x5/next business day (NBD) terms. Lenovo offers the service upgrades through warranty maintenance upgrades and post-warranty maintenance agreements with a well-defined scope of services, including service hours, response time, term of service, and service agreement terms and conditions. The following table explains warranty service definitions for the E1012 and E1024 enclosures. On-site service A service technician will arrive at the client location for equipment service. 24x7x4 hour A service technician is scheduled to arrive at the client location within four hours after remote problem determination is completed. Lenovo provides service around the clock, every day, including Lenovo holidays. 9x5x4 hour A service technician is scheduled to arrive at the client location within four business hours after remote problem determination is completed. Lenovo provides service 8:00 am - 5:00 pm in the client's local time zone, Monday-Friday, excluding Lenovo holidays. For example, if a customer reports an incident at 3:00 pm on Friday, the technician will arrive by 10:00 am the following Monday. 9x5 next business day A service technician is scheduled to arrive at the client location on the business day after remote problem determination is completed. Lenovo provides service 8:00 am - 5:00 pm in the client's local time zone, Monday - Friday, excluding Lenovo holidays. Calls received after 4:00 pm local time require an extra business day for service dispatch. Next business day service is not guaranteed. Lenovo's Hard Drive Retention service is a multi-drive hard drive retention offering that ensures your data is always under your control, regardless of the number of hard drives that are installed in your Lenovo system. In the unlikely event of a hard drive failure, you retain possession of your hard drive while Lenovo replaces the failed drive part. Your data stays safely on your premises, in your hands. The Hard Drive Retention service can be purchased in convenient bundles with our warranty upgrades and extensions. The E1012 and E1024 expansion enclosures are supported with the RAID adapters and HBAs that are listed in the following table. 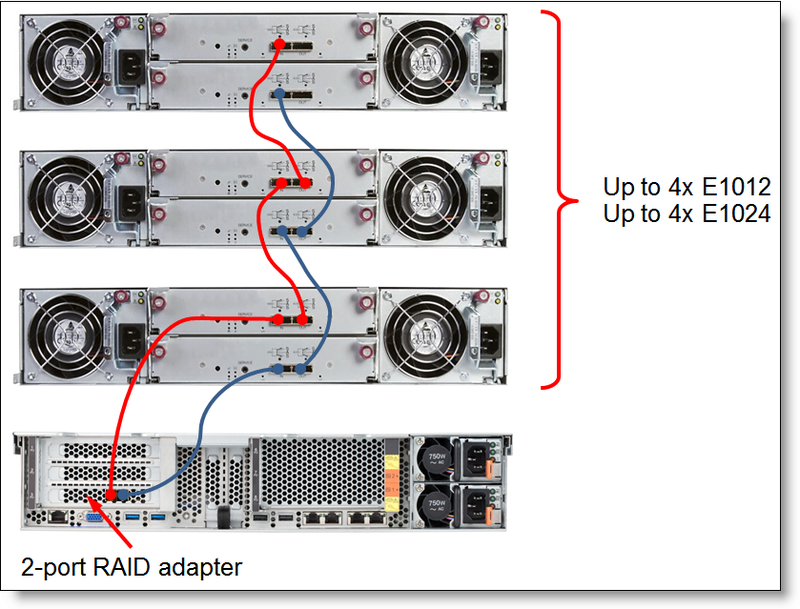 The following table summarizes features of supported RAID adapters. The E1012 and E1024 expansion enclosures support the following operating systems that are supported by RAID adapters and HBAs listed in RAID adapters and HBAs. The following table lists the rack cabinets that are currently offered by Lenovo that can be used for mounting the E1012 and E1024 storage expansion enclosures and other IT infrastructure building blocks. The following table lists the power distribution units (PDUs) that are currently offered by Lenovo that can be used for distributing electrical power to the E1012 and E1024 storage expansion enclosures and other IT infrastructure building blocks mounted in a rack cabinet. The following table lists the uninterruptible power supply (UPS) units that are currently offered by Lenovo that can be used for providing electrical power protection to the E1012 and E1024 storage expansion enclosures and other IT infrastructure building blocks.